At the beginning of the 19th Century Grand Lodge resolved that Scotland should be divided into Districts and that Provincial Grand Masters be appointed - this being a re-enactment of the old decrees of Grand Lodge. On 1st February, 1802, Brother Major James Mayne of Powis Lodge was appointed Provincial Grand Master. In 1804 Brother Major Mayne had 15 Lodges under his jurisdiction. In the early 19th Century, Masonic Lodges were much in demand for the laying of foundation stones. The laying of foundation stones was not, however, the prerogative of Daughter Lodges and on 27th August, 1822, the Foundation Stone of the National Monument of Scotland was laid on Calton Hill in Edinburgh by the Grand Master Mason, Brother Alexander, 10th Duke of Hamilton and Brandon. In attendance on that occasion was Brother Thomas Graham Stirling of Airth who, earlier in the same year, had been appointed Provincial Grand Master of Stirlingshire. He was Convener of County of Stirling and died in Office in 1836 at age of 68. In 1827, Linlithgowshire, which had hitherto been part of a joint Province with Stirlingshire and Clackmannanshire, became a separate Province. The laying of the Foundation Stone of the new Bridge over the Forth at Stirling, on 8th September 1831, must have been a splendid occasion. The Masons marched in procession from the Guildhall, through Stirling, to the site of the Bridge. Each of Masonic Lodges was preceded by a band. The day of laying the Foundation Stone was the day of the Coronation of William IV and it was announced at the ceremony that the Bridge was to called the King William IV Bridge. It had be intended that the Stone be laid by the then Convener of the County, Brother Thomas Graham Stirling of Airth, who was also Provincial Grand Master. He was, however, unable to be present and the ceremony was performed by Brother William Murray Touchadam, the Depute Provincial Grand Master. As befits the occasion, the crystal bottle lodged with the Stone’s cavity contained the Proclamation for King’s Coronation dated at St. James 15th July, 1831, a copy of the said Act of Parliament passed on 11th May, 1829 and a copy of local and national newspapers of the time together with a selection coins of the realm. Brother Colonel the Hon. George Abercromby, (afterwards 3rd Lord Abercromby), was appointed Provincial Grand Master on the death of Brother Thomas Graham Stirling of Airth. The Commission in his favour was issued on 1st August, 1836. His grandfather was an eminent Freemason, the celebrated General Sir Ralph Abercromby. Sir Ralph had been born at Menstrie House in 1734, some 154 years after the birth there of Sir William Alexander, afterwards the Earl of Stirling. The Earl of Stirling’s three sons were all Masons. His second son, Sir Anthony Alexander and his younger brother Henry Alexander, were both Masters of Works and General Wardens. Sir Anthony Alexander was the author of certain laws relating to the conduct of tradesmen. It is interesting to note that in minutes relating to Sir Anthony’s Laws in 1637 the name ‘John Serves, Maesson, Warden’ appears and in minutes relating to a court held by Mr. Henry Alexander, in 1638, the name ‘John Service, Maesson, Warden’, is mentioned. It is probable that this is the same ‘John Serveite’ for whom a notary signed the St. Clair Charter in 1628. On 5th August, 1850, Brother Sir Alexander Charles Gibson-Maitland, 3rd Baronet of Cliftonhall, was appointed Provincial Grand Master. He was a member of Lodge Canongate Kilwinning, No. 2. He served as Provincial Grand Master for some 20 years, during which period several events of national and local importance took place. On 3rd August, 1854 the Provincial Grand Master laid the Foundation Stone of the new High School of Stirling. The site was at the corner of Spittal Street and Academy Road and the school buildings have now been converted into the Stirling Highland Hotel. As usual a cavity within the Foundation Stone contained, in addition to the copies of newspapers and coins, a list of subscribers and civic authorities, the Masonic Calendar and pocket book for 1854, the Grand Lodge Annual Circular for 1853 and a Roll of Members of Grand Lodge at 1st May, 1854. It is particularly interesting to note the denominations of the coins included:- sovereign, half-sovereign, crown, half-crown, florin, shilling, sixpence, four pence, three pence, two pence, penny, half-penny, farthing and half-farthing (the last being equivalent to a 1,920th part of the present £1). The inscription on the Foundation Stone states:­ “The Foundation Stone of the High School of Stirling was, on the 3rd day of August, 1854, in the Eighteenth Year of Her Majesty Queen Victoria, laid with Masonic Solemnities by Sir Alexander Charles Gibson-Maitland, Baronet of Cliftonhill, Provincial Grand Master assisted by the Grand Lodge of Scotland and many Daughter Lodges “. The Lodge of Alloa No. 69 celebrated its centenary on 14th November, 1857, when the Provincial Grand Master conducted the ceremony of rededication. By 1858, only six Lodges in the Province were in full working order. Two were dormant and several had become extinct during the previous half century. However, 1859 saw the commencement of a new era for Freemasonry. On 7th February, 1859, Grand Lodge granted a Charter for a Lodge at Grangemouth, to be numbered 391. 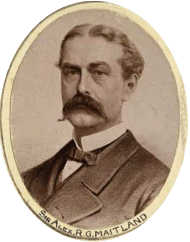 The Grand Master Mason of England at the time was Brother the Earl of Zetland, and he granted the Lodge the privilege of naming the Lodge “Zetland”. The Lodge adopted the colour of the Earl’s livery as the Lodge regalia colour. The Foundation Stone of the new Sheriff Court House in Linlithgow was laid on 10th July, 1863, by the Provincial Grand Master, Brother Sir Alexander Charles Gibson-Maitland who, for this purpose, became acting Provincial Grand Master of Linlithgowshire for the day. On the 14th March 1865, Lodge St. Andrew No. 176, Denny, was reponed by Lodge Old Monkland St. James No. 177 and placed in the Province of Dunbartonshire. Brother Major General Sir James Alexander of Westerton, C.B., was appointed Provincial Grand Master on 6th May, 1870 and installed at a ceremony in the Golden Lion Hotel, Stirling, on 19th July, 1872, by Brother Henry Inglis, Substitute Grand Master Mason. On 17th October, 1872, the Foundation Stone of the new Municipal Buildings in Alloa (Bank Street) was laid by Brother Major General Sir James Alexander of Westerton, C.B., Provincial Grand Master. Over 300 proceeded from the Royal Oak Hotel, Bedford Place, to the site in Bank Street. A plate on the Foundation Stone bore the following inscription:­ “The Foundation Stone of these Buildings was laid with full Masonic Honours on 17th October 1872, by Major General Sir James Alexander of Westerton, Provincial Grand Master of Stirlingshire “. On 5th April, 1873, Lodge St. John Royal Arch No. 195, Campsie, was inspected by the Provincial Grand Master. This was to be the forerunner of frequent visits made to all Lodges in the Province. In 1874 Brother George Christie of Lodge Ancient Stirling No. 30, who was later to become Provincial Grand Master, presented a pair of swords to Provincial Grand Lodge for the use of the Inner Guard and Tyler. Lodge St. Andrew, Denny and Loanhead, No. 176, which had been reponed on the 14th March, 1865 and placed in the Province of Dunbartonshire was transferred to Stirlingshire, on 2nd February, 1874. The Provincial Grand Master laid a Memorial Stone of the new Quoad Sacra Church at Grahamston, on 7th October, 1875 and was presented with the ceremonial trowel by Brother Provost John Russell of Falkirk. On the 6th June, 1879, the Provincial Grand Master laid the Foundation Stone of the Masonic Hall for Lodge St. John No. 16, in Falkirk. Brother John Russell, on behalf of Lodge No. 16, presented a silver trowel to Major General Sir James Alexander, as he had done as Provost of Falkirk some four years previously, at the laying of the Memorial Stone of the Quoad Sacra Church at Grahamston. On 5th April, 1882, Brother Lord Balfour of Burleigh, acting for the Grand Master Mason, laid the Foundation Stone of the Caledonian Railway Bridge at South Alloa. The Provincial Grand Master was also present. The Provincial Grand Master, Brother Major General Sir James Alexander of Westerton, died in April, 1885 and at his funeral on 8th April, Brethren marched in front of the hearse to Logie Old Churchyard accompanied by the band of the 3rd Battalion, the Argyll and Sutherland Highlanders. Brother The Earl of Mar and Kellie was installed as Provincial Grand Master at Alloa on September, 1885, by Brother Sir Archibald Campbell of Blythswood, Grand Master Mason. The Earl been an ex office-bearer of the Lodge Marquis of Dalhousie, London. Brother Walter Henry, the Earl of Mar and Kellie, was Grand Master Mason from 1882 to 1885. He was initiated under the English Constitution and was appointed Junior Grand Deacon before he was a member of a Scottish Lodge. He affiliated to the Lodge of Edinburgh (Mary’s Chapel) No. 1. At a Communication held on 9th August, it was intimated that Lodge St. John, Tulliallan No. 598 had been transferred from the Province of Perthshire East to Stirlingshire. At the communication, Brother Captain A.H. Middleton, Junior Provincial Grand Warden, presented Square and Compasses to Provincial Grand Lodge. At the January Communication of the Provincial Grand Lodge, in 1887, Brother William Black, Substitute Provincial Grand Master, presented Provincial Grand Lodge with a handsome mallet made from timbers from the Charlotte Dundas, the first steamship built. Brother John Taylor, Senior Provincial Grand Warden, presented two Wardens’ Batons made from the same source. The Memorial Stone of Alloa Town Hall was laid by Brother the Earl of Mar and Kellie and the customary selections of coins, newspapers and memorabilia were placed in the cavity of the Stone. The Stone was inscribed as follows: “The Memorial Stone of the Town Hall and Library presented to the Town of Alloa by John Thomson Paton of Norwood, Alloa, was laid by the Right Honourable the Earl of Mar and Kellie, Right Worshipful Provincial Grand Master of Stirlingshire, on Saturday 2nd April, 1887, the Jubilee Year of Her Most Gracious Majesty Queen Victoria “. The trowel used in the ceremony was presented by Mr. Paton to the Provincial Grand Master. Lodge Zetland which had been under the jurisdiction of the Provincial Grand Lodge of Linlithgowshire was transferred to Stirlingshire on 19th May, 1888. The Lodge was concerned in the laying of the Memorial Stone of the Grangemouth Victoria Public Library by Brother the Earl of Zetland, a member of the Lodge, on 1st October, 1888. Brother Michael Hugh Shaw Stewart of Carnock, later Sir Hugh Shaw Stewart, was installed as Provincial Grand Master at Falkirk by Brother Sir Archibald Campbell, Grand Master Mason, on 25th April, 1889. On 27th April, 1889, the Provincial Grand Master laid the Foundation Stone of a new hall for Lodge St. John No. 598. It was agreed on 29th October, 1889, that each initiate would pay 1/- (5p) to Provincial Grand Lodge Benevolent Fund. New premises at 27 King Street, Stirling, for Lodge Ancient Stirling No. 30, were consecrated by the Provincial Grand Master, Brother Michael Hugh Shaw Stewart, on 31st October, 1889. Provincial Grand Lodge resolved, on 28th January, 1892, that the contribution payable by each entrant and affiliate to the Provincial Grand Lodge Benevolent Fund be raised to 2/- (10p). On 5th August, 1892, Brother Charles Dalrymple of Newhailes, Depute Grand Master Mason, and a deputation from Grand Lodge, visited Provincial Grand Lodge. On the same date the Provincial Grand Master, Brother Michael Hugh Shaw Stewart laid the Memorial Stone of the new Church Hall for Falkirk Parish Church. Brother Michael Hugh Shaw Stewart intimated his resignation on 31st January, 1893, on his appointment as Provincial Grand Master of Renfrewshire West Province, in succession to his father. Brother ex Provost George Christie was installed as Provincial Grand Master by Brother the Earl of Haddington, Grand Master Mason, on 4th April, 1893. The Foundation Stone of the Lodge Polmont’s new Hall was laid by the Provincial Grand Master on 8th June, 1895. Brother William Black, Depute Provincial Grand Master and Architect, presented the silver trowel to Brother Christie. The consecration of the Masonic Hall, Brightons, was conducted by Brother George Christie, Provincial Grand Master, on 20th November, 1895. At the Communication of Provincial Grand Lodge held on 25th February, 1896, Lodge Strathendrick No. 780, requested that the Lodge be permitted to transfer from Killearn to Balfron (reserving consideration of the request to hold occasional meetings in Killearn and Buchlyvie). The transfer to Balfron was sanctioned but the further request regarding meetings at Killearn and Buchlyvie was not granted. During 1899 the Lodge of Alloa No. 69, received a communication from Lodge St. Serf No. 327, Kinross, proposing the formation of a Provincial Grand Lodge of Clackmannanshire and Kinross. No further action was taken on this matter. In 1898 Brother George Christie was re-elected Provincial Grand Master for another 5 year term.